"One of the goals of our program is that students obtain a solid understanding of the methods and computing tools employed in data analysis today." A Presidential Fellow at the University at Albany, SUNY (2003-06), Chris Wedrychowicz has been teaching mathematics for almost ten years. 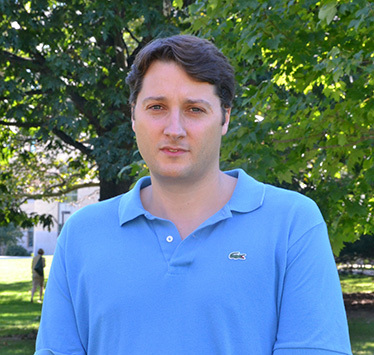 He has published papers dealing with topics in Real Analysis and Number Theory, and is dedicated to helping students learn the best methods to solve complex data challenges. AMS Fall Central Sectional Meeting, October 2013. Seminar in Analysis, Aristotle University of Thessaloniki, Thessaloniki, Greece, June 2012. Joint Meetings, Boston, MA, January 2012. Seminar in Analysis, Indiana University Bloomington, November 2009. Seminar in Analysis, University of Illinois at Urbana-Champaign, October 2009. Joint Meetings, Washington, D.C., January 2009. Seminar in Analysis, Aristotle University of Thessaloniki, Thessaloniki, Greece, Summer 2008. Seminar in Analysis, University of Crete, Crete, Greece, Summer 2008. Almost everywhere convergence of convolution powers without finite second moment, Ann. Inst. Fourier, 61, (2011), no. 2, 401-415.